Mumbai: Penna Cement Industries Ltd is planning to raise Rs1,300 crore through an initial public offering (IPO) and will file its draft offer documents with the markets regulator in the next two months, two people close to the development said. The Hyderabad-based firm, founded in 1991 by P. Prathap Reddy, has hired Edelweiss Financial Services Ltd, IIFL Holdings Ltd and JM Financial Ltd as book runners for the public offering, the proceeds of which will be used to fund expansion, according to the people cited above. “Currently, Penna Cement has a production capacity of 7 million tonnes per annum (mtpa). It intends to expand the capacity to 14 mtpa by 2020," one of the people mentioned above said on condition of anonymity, as he is not authorized to speak to reporters. The company has four cement plants and one captive power plant across Telangana and Andhra Pradesh. Its product offerings include ordinary portland cement, special blended cement and slag-based blended cement. Calls and an email sent to Penna Cement did not elicit any response. Emails sent to Edelweiss, IIFL, JM Financial did not elicit any response. “The equity markets are still benign and the firm is looking to tap the IPO window before the market volatility sets in ahead of the elections," said the second person mentioned above, also on condition of anonymity. So far this year, 14 companies have raised Rs18,591.7 crore through the IPO route. In 2017, 36 companies raised Rs67,147.1 crore through IPOs, data from primary market tracker Prime Database shows. Both financial and strategic investors have shown considerable interest in the cement sector. 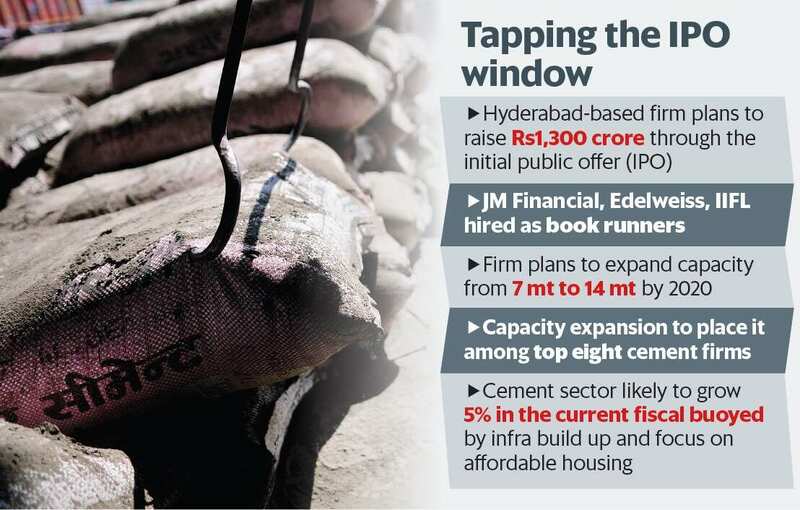 Some of the cement firms which recently tapped the equity markets include Sanghi Industries Ltd, Srikalahasthi Pipes Ltd and NCL Industries Ltd. These three firms together raised around Rs850 crore last year through qualified institutional placements. According to analysts, the Indian cement sector is expected to grow at 5-6% during the current fiscal. “There is over-capacity in south India. Given the strong demand for cement backed by the new infrastructure that is being set up in Andhra Pradesh and Tamil Nadu, over capacity should not be a big concern. Also, given the fact that states down south are focusing aggressively on affordable housing, demand for cement is likely to be high," said Ashish Nainan, research analyst—infrastructure at Care Ratings Ltd.
Nainan added that ramping up the capacity to 14 mt is likely to put Penna Cement among the top eight cement makers in the country with respect to production. He, however, warned that given the presence of strong local brands like India Cements and Ramco, making a mark could be a challenge. The infrastructure push by the central government is also helping the cement sector. The current NDA government has had a strong focus on infrastructure spending. Beginning with a Rs1.81 trillion allocation in 2014-15, government expenditure towards infrastructure reached Rs4.94 trillion in 2017-18. For 2018-19, the government announced infrastructure spending of Rs5.97 trillion.